How do I schedule Pins to publish on Twitter? Pinterest has depreciated Syncing Twitter as a Social Network as of June 2018. Unfortunately, that means you can no longer sync new profiles to share to Twitter while scheduling. If you already synced your Twitter before June 2018, the functionality still works! Sending your pins to other social networks can be a great and easy way to sprinkle a touch of you or your brand and find more reach across your audiences! To get started we've included how to connect your Twitter account and some helpful information when cross-promoting on social media. Looking to schedule to Facebook, instead? 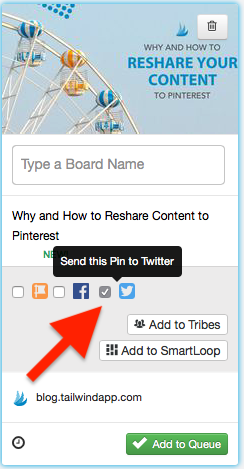 If you've synced your Twitter as a Social Network on Pinterest, click the checkbox next to the Twitter logo on a draft or scheduled pin to also send this pin to Twitter. Helpful Tip: Did you just sync your account to Pinterest but can't yet schedule your pins to Twitter? Try Refreshing Your Username to enable this feature! While scrolling through your Facebook and Twitter feeds, you might notice that the sites are pretty text heavy. Sure, you’ll probably see an inspiring quote from a brand and some pictures from your friends night out, but other than that the sites are almost entirely text-based. Although the descriptions are important on Pinterest – especially when it comes to setting yourself up for Pinterest SEO success – the images are what people are looking for. Pinterest is for discovery, not discussion. People are on Pinterest to discover new things, plan for a future event, or just get inspired. Users are searching for new experiences – starting a new life with their partner, planning a new place to visit, trying a new way to decorate their home or their body. In fact, the discovery side of Pinterest makes the site more equivalent to a Google or a Bing – not a Facebook or Twitter.